By hosting events such as seminars and field days, we are able to provide opportunities for stakeholdhistory-timeline_september-2016-draft-v1 ers to exchange ideas and issues, which helps drive research. By developing useful and shareable resources, such as the Farmers’ Newsletter, we are able to extend research and advisory information. By hosting irrigated farm competitions, to recognise and showcase excellence, we are able to elevate the status of the irrigated agriculture industry in the MIA. What we do and how we do it has been strongly influenced by IREC’s proud history. 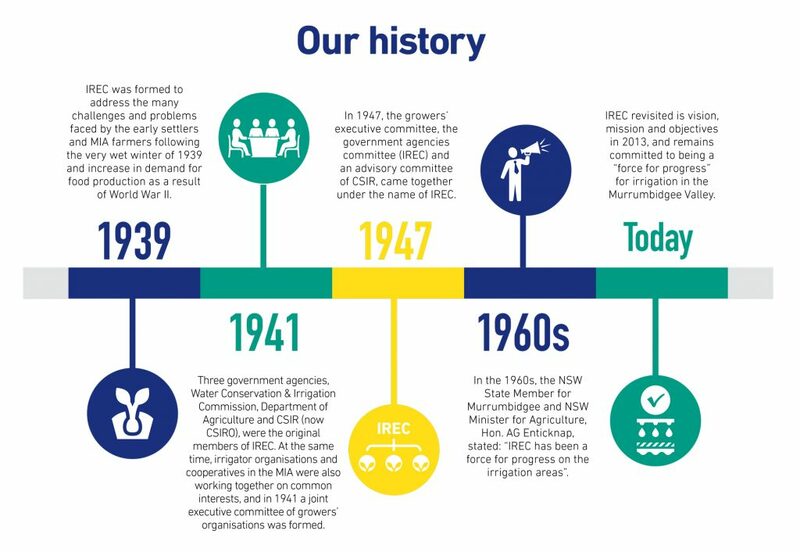 Established in response to the very wet winter of 1939, coupled with an increase in demand for food production as a result of World War II, IREC was formed to address the many challenges and problems faced by the early settlers and farmers of the Murrumbidgee Irrigation Area (MIA).